Get out your rolling pins! 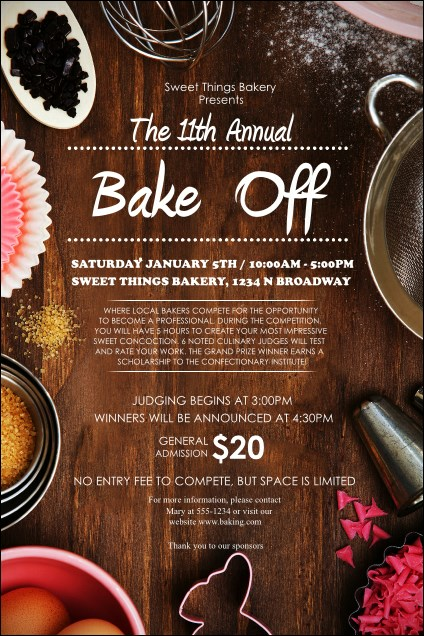 It's time to practice your baking skills! Advertise your culinary workshop or bake-off with the delectable Baking Poster. This sweet template features cookie cutters, eggs, a whisk, and other tools on a dark cutting board. List your details in twenty-two sharp lines of white text. Poster measures appx. 11.46" x 17.18"
Mix in some tickets, invitations, and fliers with a Matching Event Kit from TicketPrinting.com.